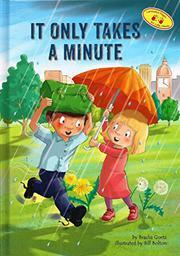 Some parents may find that they need this picture book more than their children do. The book is a sort of checklist. It describes tiny acts of kindness that people can perform in about 60 seconds: “It only takes a minute to smile at people, especially those who really seem to need a smile.” Other items on the list aren’t so much acts as moments of quiet contemplation: “It only takes a minute to look more closely at the things I see—like a flower, and a fluffy white cloud, and the bright blue sky…and to remember Who made all those lovely things.” The book is clearly addressed to an observant Jewish audience. All the boys in the pictures are wearing skullcaps. (Most of the characters are white, but one of the Jewish boys has brown skin.) But with so much political turmoil in the headlines, even less-religious readers may appreciate the general philosophy and find the book a calming alternative to watching the news. (The endpapers are filled with pictures of clanging clocks and bells, cleverly designed to make readers appreciate calmness and mindfulness.) The repetitive format means that the story lacks drama, but these days, drama is the last thing some people need.